NOTE: Always remember to ch1 and turn your work. FO. Leave long tail to sew up your cube. FO. Leave long tails to sew. Note: Sew up your cube. Add safety eyes on one of the white sides. (This is just my personal preference but i did flip the inside-out before stuffing and closing up the edges). Sew arms and legs onto the doll. Awww it's so so so cute! I'll try these pattern for sure! Thanks so much for sharing. Btw, i really love your work too. Been watching your page for a while now. 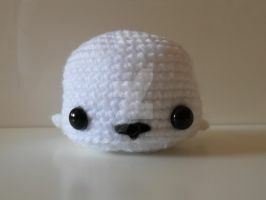 I have one doll for myself on my list so far (Pillow from Npantz22) to make, but then I'll tackle the cute Tofu. Adorable! 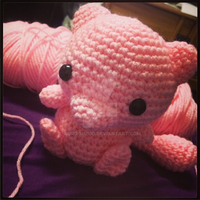 Thank you so much for the free pattern-I might just be making this in the near future. Thank you for the free pattern this is adorable!! Can't wait to make this for my vegan friend! !